144 Rolls (i.e. 4 boxes of 36 rolls) of Crossweave Reinforced Tape 25mm x 50M. This is the strongest tape avialable on the market. 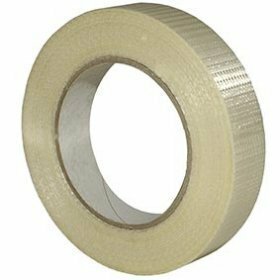 It is reinforced tape with glass fibre filaments - tear/burst resistant and perfect for reinforced boxes/ heavy goods. It will keep its grip for years - suitable for most surfaces.